England has a long tradition of apple cultivation. The idea of growing culinary apple varieties started in Victorian times and quickly became part of local culture. 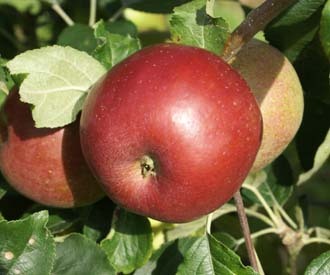 The Herefordshire Beefing is one of the oldest cooking apples in England, with its first reference dating back to the 1700s. The name derives from the historic English county of Herefordshire in the West Midlands. The apple is rather small in size, with a roundish shape and ribs. It is dark red with a cinnamon-colored russet. The Herefordshire Beefing is valued for its rich flavour; a good, sharp and slightly sour taste that sweetens with time. It is at its best when used early in the season. It keeps its shape well when cooked, thus making it excellent for tarts and cakes as well as for drying. It is a solid, crisp and very juicy apple. It ripens in October and can be stored until January. Unfortunately, the arrival of commercial varieties has led to a decline in the use of different seasonal culinary apples that used to be a part of traditional country life. The Herefordshire Beefing is not widely available today, and only a few people know about and have access to it.